Summery : Meeting Jack on the Owl – San Francisco’s night bus – turns Beatrix’s world upside down. Jack is charming, wildly attractive …and possibly one of San Francisco’s most notorious graffiti artists. On midnight rides and city rooftops, Beatrix begins to see who this enigmatic boy really is. But Jack is hiding much more – and can she uncover the truth that leaves him so wounded? A unique and profoundly moving novel, Night Owls will linger in your memory long after the final page. Not often it only takes me a day to read a book, it has to be a pretty special book. Night Owls is one of those that took me less than 24 hours to read front to back. I found it hard to put it down as the story flowed so well from one scene to the next. It’s the perfect amount of cheesy love story mixed with adrenaline pumping through pencil sketched veins. 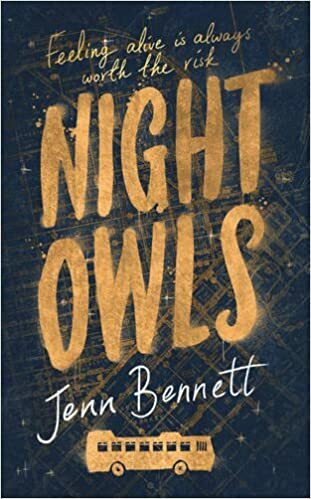 Night Owls is the first book by Jenn Bennett that I’ve delved in to and I had high hopes (that were not disappointed!) I found out about this particular novel well before its UK release and it’s probably been one of my most anticipated reads of this year. When I found an early copy of it I was more than excited to get started! I went in knowing nothing about the story, only what I imagined it to be like – and that was completely different from what happened as the story unravelled. It’s a quirky and beautiful love story of Jack and Beatrix who meet one night on the ‘Owl’ (San Francisco’s night bus) and end up kind of creepily tracking each other down. What was different to most other contemporary’s was Beatrix’s unwillingness to let Jack in to her life as soon as they met. Once they slowly started to feel more comfortable around each other you could clearly see the chemistry the characters shared between them. They’re two people who blended so well from opposite sides of life and Jenn made that happen by making Jack such a likeable and trustable character. As you should all know by now I’m a sucker for the families of a protagonist. Night Owls gives an insight in to Jack and Bex’s family lives however interesting and messed up they may be. A range of different characters made it that little bit more interesting to read – no-one wants to read the same personality traits over and over again in a novel do that? Whereas I adored Bex’s brother, Heath, I wasn’t a fan of her mum at all. She seemed overbearingly controlling – annoyingly so sometimes. All of that got outweighed by Jillian, Jack’s sister however who I absolutely adored. The most interesting aspect to this novel was the basis around art. I don’t know much about art, or the human body like Beatrix but I especially enjoyed the focus Night Owls took on art and a teenager’s passion for it. Reading a story with such a surrounding of art was quite refreshing, to see a character so focused on something they loved that was not often written about. It made the whole story that little bit more interesting. Beatrix and Jack seemed to bond over their love of art and it made the romance side of the novel believable. Overall Night Owls is a fast paced, cutesy contemporary love story with some twists you wouldn’t necessarily expect from the genre. I’m struggling to find any kind of fault with Jenn’s writing style, any young adult reader would devour this book. Moreover can we please have a sequel of Jack and Bex in college?! « WHAT I’VE READ THIS SUMMER AND TBR!